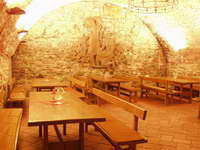 The museum's 500 sq m exhibition occupies two floors of the historical 500-year-old cellars under the Prešov Town Hall. It consists mainly of bottled wines from all corners of the world, completed with 3D wine production technology and grape vine growing exhibits. 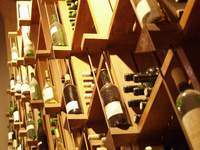 The collection currently includes more than 2000 types of wine. Visitors to the museum are guided by qualified experts, who can speak at least one international language. On the first floor there are wines from all grape vine growing areas of Slovakia. Some of the exhibited vines are from no longer existing productions. 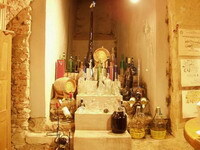 Visitors can learn additional information about each area - its size, climatic conditions, types of wine produced, etc. The exhibition is completed by a photo gallery of all well-known types of grape vine that are used in the production of Slovak wines. A separate section, devoted to the Tokay area, provides information about the Tokay wine production technology. The second floor provides space for learning about almost all European producers, but also about wines from Asia, Africa, Australia and Latin America. One part of the exhibition presents the production of sparkling wines, with a special emphasis on presenting the classic method of that technology. But you can also find there wines of other well-known technologies - Port, Sherry, Madeira and Vermouth. Most of the exhibited wines are offered for sale or tasting in a stylish shop, which is part of the museum. The offer includes gift packaging of wines in cartons, wooden cassettes, hand-made paper bags as well as wooden and metal stands of various shapes and sizes. A wide range of decorative glass bottles, jugs, caraffs and glasses are on offer, too. They can be decorated by gold or silver signatures, dedications, etc. Wine tasting takes place in the largest and most beautiful room of the museum - the Tasting Hall. Up to 50 guests can be seated on benches around oak tables. Various events can be organised there - from classic wine tasting sessions to family celebrations, wedding receptions, promotion receptions as well as corporate events and trainings. It can be adapted to hold large receptions, wine tasting sessions, wine parties and routs. For every event a cold or hot menu is available. A programme can be complemented by live cymbal music, singers, harmonica players, folk tellers or cartoonists.